So you can smile and eat normally again? Home » BLOG » Dentures » What can you do in case of a missing tooth? It is natural that we would like to relax or eat out with our family or friends, as well as enjoy a theatre play without worries. Unfortunately, losing our teeth makes our everyday life more difficult. Missing tooth can become a serious mental burden. Can we ever have a great time again, without being embarrassed by our teeth? How can we eat normally and in public again? The solution to this problem has kept people’s minds occupied for a long time. The first finding of a fake set of teeth originates from the 8th century BC, from the territory of the former Etruscan Empire. This special prosthesis was made of animal teeth. This solution turned out to be so efficient that missing teeth were mainly replaced in this way until the 1800s. In the 1700s, teeth made of special tusks also appeared. The most famous person who wore a set of teeth made of carved hippopotamus ivory was George Washington. At the beginning of the 19th century, when the use of sugar became more widespread, the demand for tooth replacement became bigger. Besides the prostheses made of carved animal teeth, dentists also used human teeth in order to achieve a life-like appearance. The human teeth mainly belonged to prisoners sentenced to death and dead soldiers. Nowadays, there are several possibilities for tooth replacement. Thanks to modern procedures, the implant placed in place of a missing tooth fits completely to our remaining, intact teeth, while the complete rehabilitation resembles our original teeth. Losing a tooth or teeth can happen to anyone. Would you have thought that Gordon Ramsay, Demi Moore and Tom Cruise all have replaced teeth? What are the causes of early tooth loss? What is the direct cause of tooth loss? What happens if a tooth is left unreplaced? How should we take care of our replacement properly? Unfortunately, losing teeth is a very common problem. According to the results of an international survey, people between the age of 50 and 64 have an average of 23 remaining teeth instead of 32. Factors that increase the probability of losing teeth include: age above 35 years, being male, skipping the regular dental check-ups, skipping brushing the teeth, diabetes, high blood pressure and rheumatoid arthritis. According to a survey, 3 out of 10 patients who need tooth implants smoke or used to smoke. 60% of the patients brushed their teeth only occasionally, while 16% brushed them two times a day. What is the direct cause of a missing tooth? Gum diseases– the primary cause of tooth loss is the inflammatory disease of the gum. The main symptoms of gum disorders are swollen, bleeding gums followed by gum recession. In serious cases, even touching the gum might result in bleeding. The gum moves away from the tooth and we lose the tooth as a consequence. If the patient’s condition involves circulatory disorders (as in the case of diabetes and high blood pressure) or autoimmune inflammatory diseases (like rheumatoid arthritis), the probability of gum disease is much higher than in normal cases. Dental caries – it is usually the consequence of inadequate oral hygiene. A so-called plaque appears on the tooth surface where bacteria can settle down. These bacteria emit acidic materials which damage the structure of the teeth. Birth defects – because of genetic disorders, the shape, number and position of the teeth may differ from the normal. We can choose from several options for replacing missing teeth, to make our smile perfect. These include complete or partial replacements with dentures and the use of dental implants. To find the appropriate solution, we should turn to a specialist by all means. Conventional denture fully attached to the gum – A denture that can be attached to the complete lower or complete upper gum can be a solution after losing all of our teeth. To ensure an adequate fit, it is important to wait for all the changes in the gums and the jaw caused by the absence of our teeth to be final. For this period, a temporal denture is prepared until the gum regenerates. After healing, our dentist will make the permanent denture based on a new impression. With the help of a flesh-coloured acrylic base, it fits perfectly to the gum and palate (in case of the lower teeth, the acrylic base is U-shaped). Partial denture – we need a partial denture if we still have some of our own teeth. The false teeth of the partial denture are attached to the real teeth with the help of a metal structure. Full implant denture – if our jaw is in an appropriate condition, it is possible to fix the complete denture in a more stable way. It is usually done while replacing the lower set of teeth, because the conventional lower denture can only be attached to the gum in a less stable way. 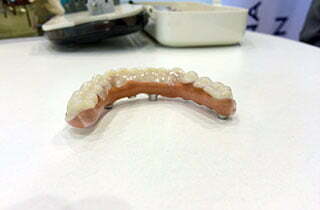 Wearing a removable denture is an unusual, uncomfortable feeling at first. Also, it can cause some inconvenience until our gum gets used to the new device. It can temporarily increase salivation but it will pass after getting used to the denture. During acclimatization, we should make sure that we don not eat foods which are too hard or sticky. It is useful to cut the food into smaller portions so the modified chewing movements will not cause a problem. After the implementation, our speech will also change – in order to be able to get our speech back to normal, we should read out loud for 15 minutes two times a day. 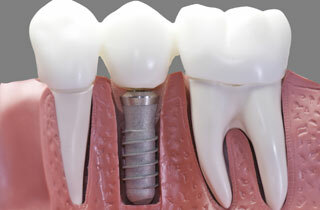 Today, dental implants (artificial tooth roots) are the most modern solution to replace one or more missing teeth. The dentist inserts the titanium implant into the jawbone. After implantation, bone tissue will grow around the implant in the healing period. It keeps the implanted artificial tooth root in place. After the healing phase of 3-6 months, the superstructure is placed on the implant. This means the implant abutment and crown made of either metal-ceramics or full ceramics. Tooth implantation requires careful preparations. Before the implantation, the dentist makes a panoramic x-ray. If the dentist judges the bone structure adequate for the implantation, they will prepare the jaw bone for the implantation in the next session. If the bone mass is insufficient, the patient needs bone grafting. Bone grafting can be done in the same session as the implantation. The intervention can take place under local or general (total) anaesthesia. We should inform our dentist about any medication that we regularly take and whether we have any drug allergy. In the 5-7 days after surgery, the gum can be tender and sensitive for which our dentist describes antibiotics. The pain following the surgery is like the inconveniences we feel after smaller dental interventions. If we pay attention to oral hygiene after the healing time, the pain will not return. The dental implant is very similar to original teeth, so it is the most comfortable solution for replacing a missing tooth. It will not alter our speech, we can eat any type of food regardless of its hardness and it gives our confidence back. It’s important to clean the denture after taking it out of our mouth with a cleaning paste specifically made for this purpose. A conventional tooth brush and tooth paste can discolour and damage the denture, so avoid using those. At night we should place the denture in water, we should not leave it out to dry. We should clean our gums and tongue with a softly bristled brush and tooth paste. For the sake of more stable fixation, in the case of conventional dentures we can use a special denture-fixing gel recommended by our dentist. The cleaning of an implanted tooth root in place of a missing tooth differs from the traditional dental care. The first priority is cleaning the complete surface of the tooth, especially the parts close to the gum. We should clean our teeth in the conventional way using a softly bristled tooth brush. Afterwards, we should loop dental floss around the implanted tooth and move it around carefully. After finishing the procedure, we should use a special interdental cleaning brush with thin bristles in order to remove plaque effectively. Not cleaning your implanted teeth appropriately can lead to serious bacterial infections which can cause gum inflammation and loss of implant in extreme cases. Protect and take care of your health!